What Is the Difference Between a Tree Frog & a Pond Frog? Arboreal and aquatic frogs are amphibians specially adapted to the environments they inhabit. An impressive array of adaptations have allowed the tree-dwelling frog species to get by without constant access to the water on which their aquatic counterparts rely. Differences in skin, reproduction, anatomy and hibernation separate the pond dwellers from the treetop denizens. All frogs rely on their skin to regulate their bodies' moisture level. A pond frog's skin is kept moist by swimming and living near water. Aquatic frogs also maintain a layer of mucus on the skin to retain moisture, which is replenished when the frog takes a dip. Some pond frogs have creative ways of staying hydrated -- they may build up several layers of mucus to combat especially dry conditions. This behavior is common among frogs living in arid climates. Because tree frogs don't swim, they must find other ways to retain water. The waxy monkey tree frog (Phyllomedusa bicolor) has special wax-secreting glands. This frog covers its skin with wax, locking in moisture against the arid conditions in which it lives. Frogs living in tropical rain forests absorb the moisture they need through their skin. No additional moisture is needed because their environment is so humid. Because they live near or in water year-round, pond frogs have no issue with taking a dip to mate. The females lay their eggs in clumps on the undersides of plant leaves in the water, or attached to other underwater structures. The tadpoles live and develop into adults in the pond where they hatched. Arboreal frogs' tadpoles still need to develop in water, so the parents must find more creative ways to access it. Laying eggs in nests hanging above a pond is a common way tree frogs provide their offspring access to water. Some parent frogs carry the eggs in pouches on their backs, or even in their throats, until they are ready to hatch into tadpoles. Gastrotheca cornuta is an example of a frog that carries its tadpoles in a pouch. Pond frogs are designed for swimming and hopping, with long, strong back legs. The front limbs are generally small, used for steering during swimming or catching the frog's fall while landing a hop. The feet are webbed to aid in propelling the frog through the water. Typically tree frogs have sticky pads on their toes that help them climb. Their front and back limbs are often roughly equal in length to make climbing, leaping between branches,and landing more efficient. Despite its chubby physique, White's tree frog (Litoria caerulea) is quite adept at leaping and other acrobatic movements. Some tree frogs don't jump much at all, instead relying on a hand-over-hand method of locomotion when navigating the canopy, for example the giant monkey frog (Phyllomedusa bicolor). It's typical for pond frogs living in temperate climates to hibernate over the winter. This is usually done by settling into the mud at the bottom of the pond. The frog lowers its heart and breathing rate so dramatically that it can survive months with hardly any oxygen or warmth. Tree frogs living in temperate zones also hibernate, but they do so under forest floor objects like logs or rocks, or they find a niche in the bark of a tree in which to nest. 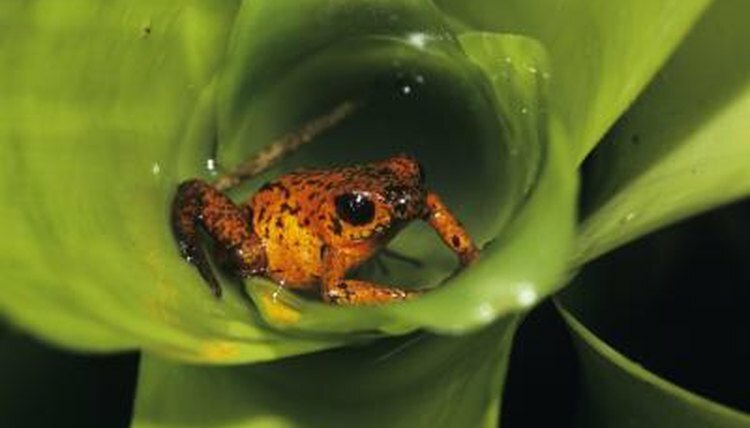 Hibernation isn't necessary for pond and tree frogs living in tropical zones. Frogs, Toads and Treefrogs: Everything About Selection, Care, Nutrition, Breeding and Behavior: Bartlett, R. D.; Bartlett, Patricia.